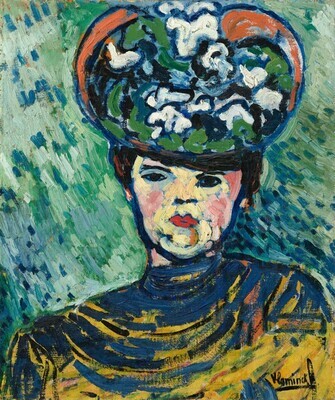 Sold May 1906 by the artist to Ambroise Vollard [1867-1939], Paris; sold to (Galerie de l'Élysée [Jean Metthey], Paris); sold c.1950 to (Galerie Lucien Bourdon, Paris); sold January 1951 to (Sidney Janis Gallery, New York); sold November 1951 to Baron [1883-1977] and Mrs. Robert von Hirsch, Basel; gift to his step-daughter, Mrs. Lili-Charlotte Sarnoff, Bethesda, Maryland; gift 1981 to NGA. Letters from Galerie Lucien Bourdon dated 7 August 1986 and 12 February 1987 confirm that the painting was acquired by them from Metthey on the rue du Faubourg Saint-Honoré, Paris (NGA curatorial records). The 2008 Vlaminck catalogue raisonné, in addition to other sources on the Fauves, identifies this gallery with the Galerie de l'Élysée, which held exhibitions of Vlaminck in 1935, 1938 and 1948. Letter from Sidney Janis Gallery dated 30 June 1986 (in NGA curatorial files). 5 Years of Janis: 5th Anniversary Exhibition, The Sidney Janis Gallery, New York, 1953, no. 55, repro. Sauvage, Marcel. Vlaminck, sa vie et son message. Geneva, 1956: repro. p. 20. European Paintings: An Illustrated Catalogue. National Gallery of Art, Washington, 1985: 428, repro. Strick, Jeremy. Twentieth Century Painting and Sculpture: Selections for the Tenth Anniversary of the East Building. Washington, D.C., 1989: 16, repro. 17. Vallès-Bled, Maïthé. Vlaminck. Paris, 2008: no. 121, repro.